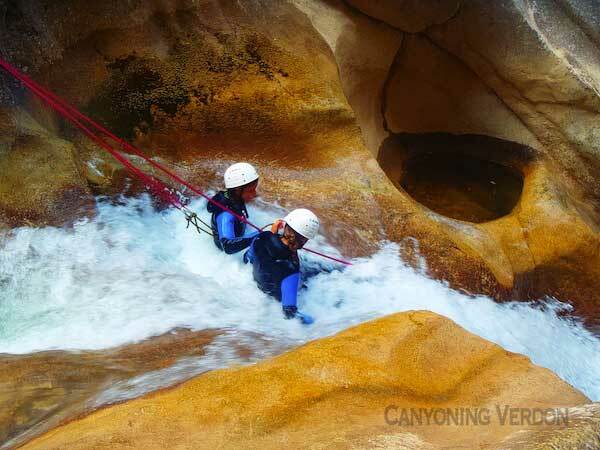 Canyoning (or canyoneering) is an outdoor activity using techniques such as jumping, abseiling, swimming or walking. It consists to walk a river down. You'll disappear through a narrow gorge with beautiful sculpted cliffs and awesome waterfalls. That is the funiest outdoor activity. You will see, the landscape is marvellous. Our team have selected for you the finest canyons lied in the South-eastern France. From Castellane, you need 35 minutes drive to get the beginning of the Saint Auban canyon. It is aquatic, varied and cadenced. His particularity is his zipline that lengthens 30 meter long enabling to go down a 12 meters-high waterfall. Doubtless one of the most magnificent canyon of France. Natural slides, jumps, abseilings. All this is to be found here. This canyon takes place in a splendid environment. It is located 55 kms from Castellane. 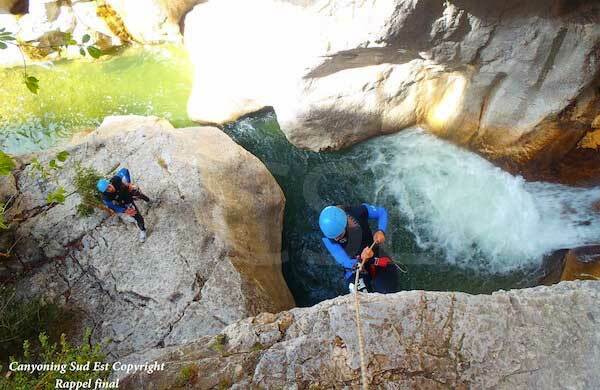 10kms from Castellane, the Haut Jabron canyon is very varied and offers jumps, slides and one abseiling reaching 13 meter high. It's possible to get around every obstacles. That's why, it is the perfect canyon to begin this activity. 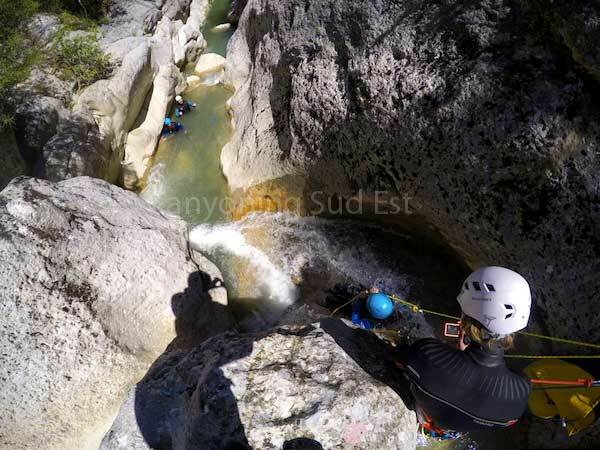 The canyoning reference of the Alpes Maritimes. 6 hour long into a splendid landscape. This canyon is very varied with jumps, slides and abseilings. You must be fit to plan to do it. Located 50 minutes drive from Castellane, the Lance canyon is a very nice alpine round (alt : 1600 meters high). There are a lot of jumps and abseiling reaching until 20 meter high. This canyon is physical, aquatic and cold. In the Alpes Maritimes, the Aiglun canyon is one of the most splendid. It is very aquatic with many jumps into clear and turquoise rock pools. 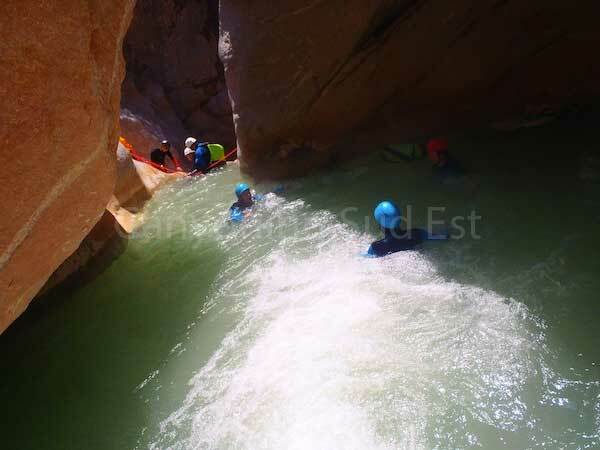 The Gours du Ray is nice half-day initiation canyon. 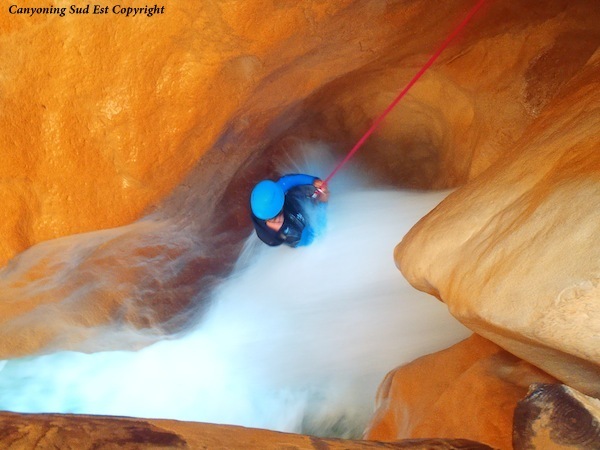 In the middle of the wild, it is a nice occasion to discover canyoneering in a peaceful environment. Located in the Tinée valley, the Cramassouri canyon is an amazing canyon for initiation because it is wild and offers various activities. 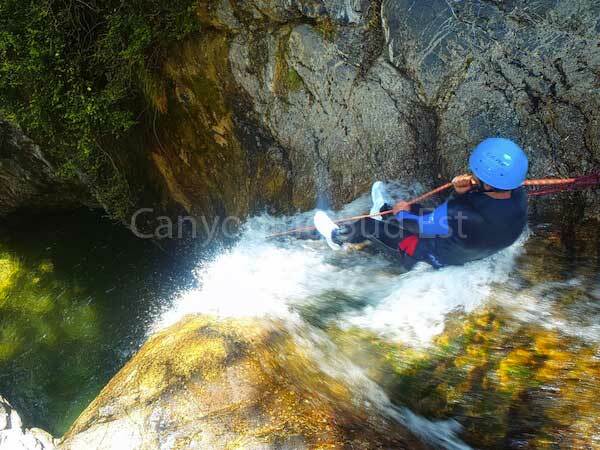 It is a pure concentration of 2h30minutes of canyoning. The Bollene canyon is located near Nice in the Vésubie valley. It is a fun itinerary with many jumps and giant slides (15 meter long). Those of you who enjoy abseiling will really find your happiness in those magnificent descents of dozens of meters high. The Maglia canyon is one of the most beautiful in Europe. It is a sportive journey where you must know how to jump. Those of you who enjoy abseiling descents and natural slides will also be satisfied. The Maglia canyon also offers an amazing passage into a cave. 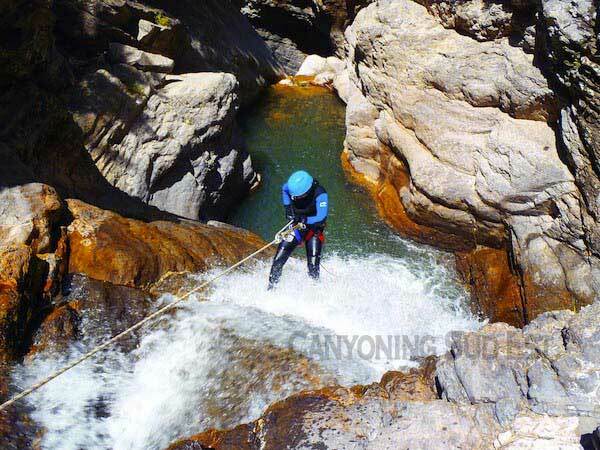 Our team provides all the canyoning equipment respecting all requirements of European standards. (EPI: Equipment for Individual Protection). 5mm wetsuit and neoprene slippers 4mm. You will only need to bring your swimsuit and your sport shoes (no sandals please). 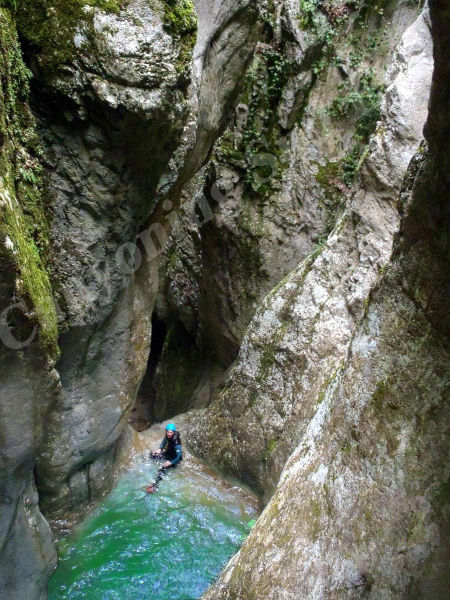 Located near Nice, in the Vésubie valley, the canyon of Imberguet offers many jumps and slides as well as some abseiling on some 20 meters high. Unfortunately this canyon is only available during spring time because the torrent is usually dry during summer. The Saint Jean canyon only offers beautiful abseiling. Unfortunately, there are no jumps or slides in this round. You can plan to do this canyon during the spring. In summer, the river does not flow anymore. The Valbelle canyon takes place in a wild context. It is beautiful but it is not varied. This canyon is dry during the summer. 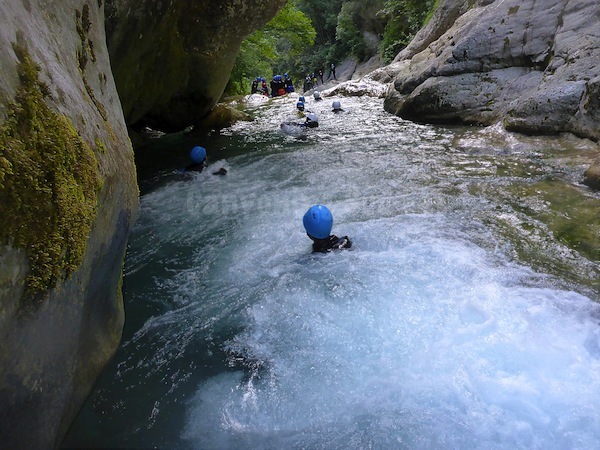 The Moustiers canyon offers awesome views and nice aquatic games in a wild environment. This canyon is dry in the summer time. The Trigance canyon offers various jumps and a nice 6 meter high abseiling. This canyon fits to families with children.